It's incredible that an island as small as Barbados is, can keep you occupied all year long. It offers, not only sandy beaches, but adventure, safaris on land and sea, hikes, cruises, including one with Pirates, horseback treks and much more... Tour on your own or hire a guide. Take a close up view of the world famous Concorde- The Barbados Concorde Experience is open seven days a week from 9a.m. to 6 p.m. Admission is $17.50 for adults and $12.50 for children 12 and under. Special group rates are available. Barbados Concorde Experience, located at Grantley Adams International Airport, includes a virtual flight school and a gift centre. The Barbados Boardwalk is now open. It's about a mile and is on the island’s South Coast. Walk or jog from Rockley to Hastings! Christ Church Parish Church, Oistins Hill, Christ Church, 428-8087 or 427-0790. The first building was erected about 1629 and was destroyed by a flood in 1669. It was rebuilt at the present site overlooking Oistins and was destroyed by a hurricane in 1870. A third building was erected and that too was destroyed by a hurricane. This is the fifth building of the Church. There are still four family burial vaults dating back to 1672 remaining on the site of the first churchyard. Graeme Hall Nature Sanctuary, Worthing, 435-9727. The Park is no longer operating...Ocean Park Barbados, Balls, 420-7405. Ocean Park is a unique Marine Aquarium. Experience underwater life up close, with 26 displays showcasing bright, colourful and exotic fish and sea life found around Barbados and the Caribbean. Host your wedding or other event. Play at the Pirate Adventure Mini-golf course and the 3000 sq. foot Splash Zone. Restaurant and Gift Shop at the park. Morgan Lewis Windmill, Highway 2. The cane crushing mill is 250 years old, believed to be the oldest and largest in Barbados. Visitors to the site can view the mill and its display of implements used in the manufacture of sugar many years ago. There's a fee for the tour. St. Andrews Church, (Anglican) Hwy#2 near Belleplaine or Shorey Village, was established circa 1630, but the one which was in existence in 1831 was destroyed by the hurricane of that year. Chalky Mount Potteries. The village situated on the slopes of Chalky Mount, is the same where pottery was made for the last 300 years. It continues today as the skill was passed from father to son. Surrounded by sugar cane fields, the six acre garden, is home to about 20,000 orchids, laid out along carefully tended paths and in dedicated greenhouses. You will find fountains, waterfalls, rock gardens, other native plants and streams among the orchids. A Snack bar and Gift Shop are on site. Wheelchair accessible. As well there is a gazebo and a restaurant which seats over 100 people, perfect for your wedding! 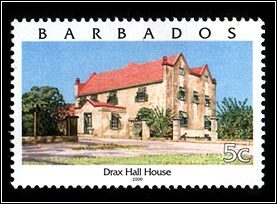 Drax Hall House, St. George. Gun Hill Signal Station, Highway 4. The station built about 1818, was left here by the British Army. Take a trip, just for the view. Fancia Plantation, St. George, 429-0474. The home was built in 1913, on a wooded hillside with gardens, by a successful Brazilian farmer. Francia also boasts a magnificent collection of antique West Indian maps. This private home is open to the public on weekdays from 10:00 a.m. to 4:00 p.m. Admission fee. St. George Parish Church, Glebe, 436-8794. This Anglican Church was rebuilt in 1784 after the original church, built between 1637 and 1641 had been destroyed in the hurricane of 1780. This building has stood the test of time as it was one of four parish churches to survive the great hurricane of 1831, and remained standing during hurricanes in 1898 and 1955. Sir Frank Hutson Sugar Museum, 432-0100. The modern factory and museum showcase a collection of restored machinery gathered from island sugar cane plantations and you can also watch the process of grinding cane at the adjoining Portvale Sugar Factory. St. James Parish Church, Holetown, 422-4117. The Anglican Church is said to be standing on one of the oldest parcels of consecrated land on the Island, often known in Barbados as "God's acre". The original wooden structure was built in 1628. A stone structure replaced the former wooden building in the early 1690's, however it was know over in the 1780 hurricane. Many of the original settlers and various noted Barbadians were laid to rest in the Church and its yard. The dates on the grave stones, vaults and memorial plaques reflect this history. There is a popular legend attached to St. James' Church, that a gate in the north wall surrounding the churchyard, referred to as 'The Devil's Gate' is opened about one hour before service. When the bell is rung the Devil leaves the church by this gate, and it is closed as the service is about to begin, so that the Devil is excluded from the area. This must have been derived from the old belief that church bells were rung to drive the devil out of the building. An underwater park where marine life can be viewed from glass bottom boats. The park houses a marine museum of photographs, artifacts and specimens of marine life. Holetown was originally called James Town. This is the site of the first landing made in 1625 by the crew of the ship “Olive Blossom”. A monument commemorates the landing. * The Jacobean style is the name given to the second phase of Renaissance architecture in England, following the Elizabethan style. It is named after King James I of England, with whose reign it is associated. Hop From Island to Island! Book Your Diving Adventure, Online.